File photo of waves crashing at Thunder Hole in Acadia National Park. 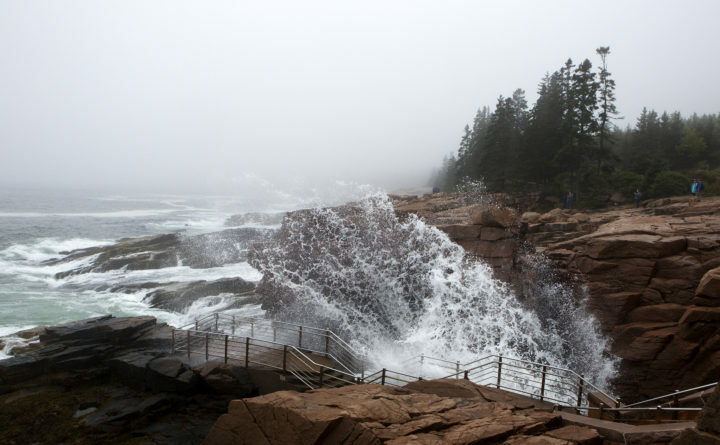 An Ellsworth man escaped serious injury after a 40-foot fall into the pounding surf of Acadia National Park earlier this week. A U.S. Coast Guard boat pulled the 20-something man from a beach closest to the Gorham Mountain parking lot, under the cliffs between Sand Beach and Thunder Hole, park spokeswoman Christie Anastasia said. “It sounded like he was stepping down from one cliff to another and he misjudged the distance,” Anastasia said Thursday. The incident occurred shortly before 6 p.m. on Tuesday. The man was fortunate to avoid the high tide, which came in about an hour later, Anastasia said. The man was taken for observation to MDI Hospital, Anastasia said.